It's been only 6 months since the iPad Pro was announced and since then there's really only a select few keyboard cases that support the new devices. Logitech has been a key player in the Apple accessories market, so we were excited when the Slim Folio Pro was announced. 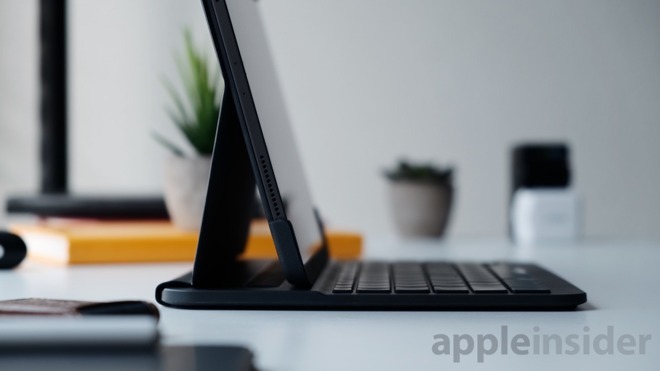 The Slim Folio Pro from Logitech is a keyboard case with a folio design —which means it folds around to protect the front and back of your iPad. It's made out of a soft silicone material and feels really durable. 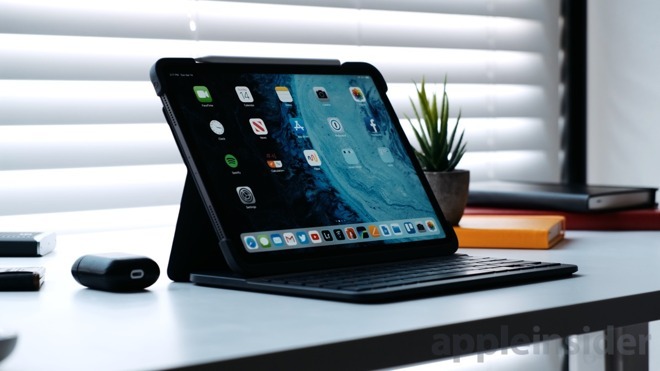 The folio style cover allows you to place the iPad in three different positions, two different angles for when you're using the keyboard and typing, and another one for when you're drawing or jotting down notes using the Apple Pencil. It's kept in place by magnets as to not slip too easily. We like this since there are times when we need the iPad to sit at a particular position, and this keyboard case allows us to do that. As a case, it protects all four corners of the iPad with this really high quality, durable, pliable silicone material. It was actually a little bit tough to put the iPad in, but once it's in, your iPad is well protected inside. To remove, two edge corners peel back for the device to slide back out. If you're an Apple Pencil user, don't fret. Logitech thought of this ahead of time and the Apple Pencil fits perfectly with this case, and still allows you to charge it wirelessly. Probably the best thing about the case is that a magnetic flap secures the pencil when it's closed up, so that pencil isn't going anywhere. This was a big issue with Apple's own folio keyboard during travel. The keyboard itself feels great. It's like typing on an old MacBook keyboard before they switched over to the new butterfly switches. The tactile response and the throw feel amazing. As much as we love Apple's own Smart Keyboard, this keyboard just feels right. This is what iPad typing should be like in the future, and we hope Apple can develop something as good as this for the next generation iPad Pros. Like most third-party keyboards for the iPad, there's also dedicated shortcut buttons that sit above the number keys. Things like changing the keyboard brightness, a home button, spotlight button, media keys, as well as a lock button to lock your iPad, and a button for Bluetooth pairing and battery button to see whether you need to charge the keyboard case or not. A really neat feature that Logitech thought about is how the keyboard activates. There's a magnetic strip just above the media keys, and when the iPad is docked, it'll automatically activate the keyboard, and when you're done, just undock it and the keyboard will automatically disconnect and turn off which is great for saving battery. These battery saving techniques are important since this keyboard runs off Bluetooth and not the Smart Connector. This keyboard charges USB-C which is amazing, and we love that more and more companies are switching over to USB-C. 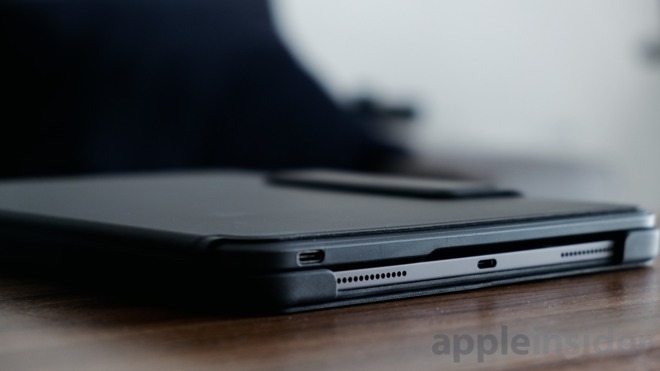 Unfortunately, a USB-C cable and charging brick is not included with this iPad, with Logitech recommending to use the one that came bundled with your iPad. 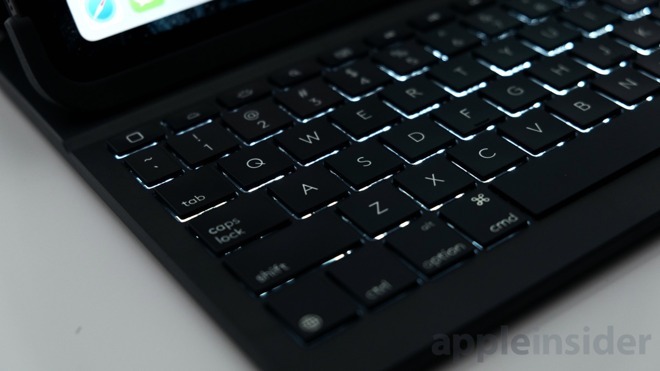 Even better, you can charge this keyboard by plugging it into your iPad Pro which is really convenient. Battery will last you roughly three months on a single charge, but obviously, that depends on how often you use it and whether or not you're using the max brightness for the keyboard backlight. Thus far it seems like the perfect companion for the iPad Pro. There is a downside though. The name Slim Folio Pro is a little misleading. The Logitech Slim Folio Pro is thick, clocking in just under an inch. It's also a lot heavier than Apple's own offering. This is a big downside for those who are looking to keep things minimal. Another thing we're not fans of is when the iPad is in its third position for drawing. 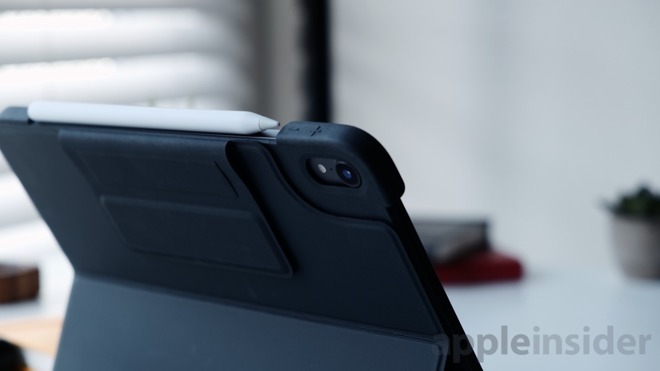 Since the keyboard case is thicker, and there's actual key travel, pushing down on the iPad on either side of the device will make the iPad uneven at times and can be a bit frustrating when using the Apple Pencil. Not a deal breaker at all, but definitely something to think about. This is easily the best third-party keyboard case for the new iPad Pros. It features a great keyboard that is backlit, a case that doesn't compromise, and it charges via USB-C. But with that added bulk and weight, that might be a huge deal breaker for some especially if you're looking for something minimal. Logitech's Slim Folio for the 11-inch and 12.9-inch iPad Pro can be ordered from Logitech directly starting at $119.99 with free shipping.